Glossy Black Cockatoo is a bit of a misnomer - not only are they the smallest but also the brownest looking of all the Black Cockatoos. Even so, in flight they are often confused with Red-tailed Black Cockatoos. The calls are similar but to me Glossies sound softer and a bit more plaintive. Adult Glossies are generally regarded as resident but do travel quite widely in search of suitable food trees. 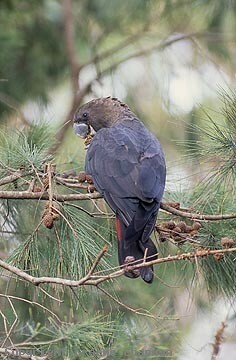 They have been known to fly up to 14 km from their roost/nest to a feeding area. Not just any old casuarina is suitable - they do seem to have favourite trees which offer the most suitable fruits. A sure sign of their presence is a mass of chewed cones on the ground beneath a casuarina - if you are lucky the birds may still be up in the tree, chewing away (it makes quite a bit of noise) and dropping the detritus on you! When feeding they are usually quite easy to approach but not easy to locate from a distance because most of the day is spent chewing with little calling. Because they are so quiet for much of the day and keep a low profile, they are probably not as rare as most people think. They mostly call in flight when travelling to and fro from food or water. This they do soon after daybreak or very late in the afternoon. They don't form flocks like Red-tails but travel mainly in twos or threes, maybe up to a dozen birds. The largest number recorded together that I know of was an aggregation of 200 birds seen on 19th October 1994 by David Johnston at a dam in the Pilliga Forest, NSW during a very dry period. Note that an aggregation attracted to a common source, in this case water, is not a flock. Socially, it is not cohesive, just a large gathering of separate families. 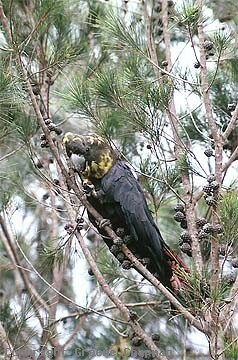 Glossy Black Cockatoos are currently divided into three subspecies. One is restricted to Kangaroo Island in South Australia and has been the subject of an intense research programme. At the other extreme of the range a smaller form in central Queensland has recently been recorded as far north as near Paluma west of Townsville. In between in southern Queensland and NSW they occur in a range of habitats from coastal heathland through to the semi-arid woodlands of the interior, but always limited by the availability of certain species of Allocasuarina and also by trees with suitable nesting hollows. 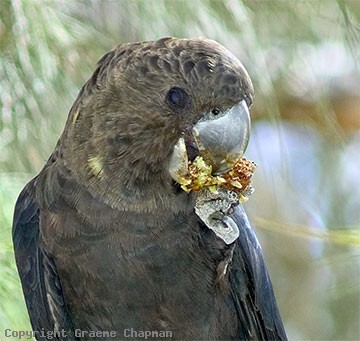 Like all Black-Cockatoos they need a large nest hollow, in the case of Glossies, often an exposed dead spout at a considerable height. Old mature trees with dead spouts are not looked on kindly by all sorts of authorities these days. No matter how small the risk they might fall and kill someone. Combined with the overall dislike of Casuarinas in general (regarded as a weed in some quarters) the poor old Glossies have an uphill battle. 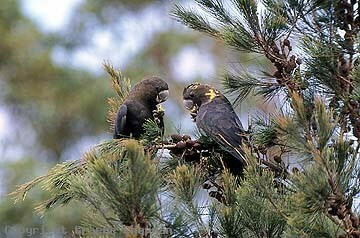 They have a long breeding season and the single egg (rarely two) is layed in winter. Fledglings stay with their parents for many months which accounts for the number of trios you will see in flight. They drink every day, mainly at dusk at favoured watering points and at such places, especially if several families gather together, there is quite a bit of activity and calling. Pics 265218 to 225 I took at one such place in inland Queensland. The low light levels so late in the day make photography extremely difficult. I still have to get a good picture of a bird landing with tail and wings fully spread. 265001 ... Glossy Black Cockatoo, male. 265003 ... Females show much variation in the amount of yellow on the head. This one has a lot. 265004 ... Glossy Black Cockatoo, adult pair, male left and female right.